Home‘Dhinchak Life’ Kindle Edition, and 10 benefits of ebooks! ‘Dhinchak Life’ Kindle Edition, and 10 benefits of ebooks! You can buy it now, without leaving your computer, as long as you have Internet access and a credit card. Kindle apps are now available for PC, Mac, Android, Windows phone, Blackberry, iPad, iPhone and iPod, for free. Ebooks are usually half the price of softcovers and one third the price of hardcovers. 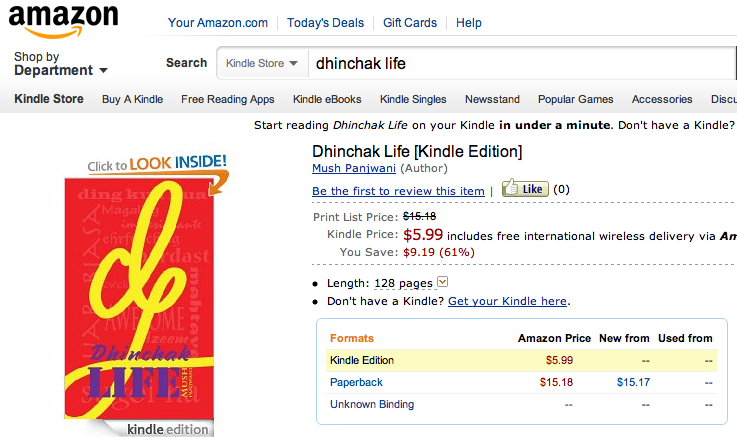 Dhinchak Life is USD15 for the softcover (plus shipping) while the ebook is just USD5.99. Ebooks are environmentally friendly – since you save on the paper, ink and chemicals. Ebooks don’t take up shelf space. Less stuff = less clutter = more happiness. You won’t lose your Kindle ebooks even if you lost the device you store them on. There’s always a copy on Amazon server. You can touch a word and look up the meaning instantly in the dictionary. You can highlight your favorite passages and go back to them later; you can also see what other Kindle readers have highlighted in the book you are reading, if you wish. You can share your highlighted pieces with friends on Facebook and Twitter. You can increase or decrease the font size, adjust the brightness and the background color to suit your eyes and the lighting conditions. No need for a reading lamp. You can carry all your books, those you have finished and those you are reading, with you while traveling. Of course, you can’t share ebooks with friends and family as you share printed books. And you still have to go to bookshops if you miss the smell of printed pages. I look forward to your comments.